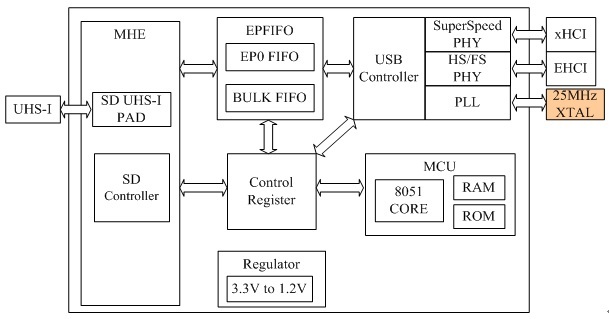 GL3213L is a crystal-less USB 3.1 Gen 1 to SD3.0/MMC Single LUN card reader controller. GL3213L can support various types of memory cards, such as Secure DigitalTM (SD), SDHC, miniSD, microSD (T-Flash), MultiMediaCardTM (MMC), RS-MMC, MMCmicro and MMCmobile on one chip. It also supports high density memory cards (Capacity up to 2TB), such as SDXC and Memory Stick XC, and high speed memory cards, SD3.0 UHS-I cards. The GL3213L integrates a high speed 8051 microprocessor and a high efficiency hardware engine for the best data transfer performance between USB and various memory card interfaces. It also integrate 3.3V to 1.2V regulators and power MOSFETs which can reduce the system BOM cost. GL3213L is available in QFN28 4*4 package. Support OCCS (on chip clock source) to eliminate the use of 25MH crystal from board. Support SuperSpeed-only connection with Intel platform.